I’m so happy for her that she is going back to (She already went) her home, but same time I was so sad that we can’t see each other any soon. She is not coming back, it is very sad for me and her friends in this town. But I guess this is the military life, lots of “Hellos” and “Good byes”. 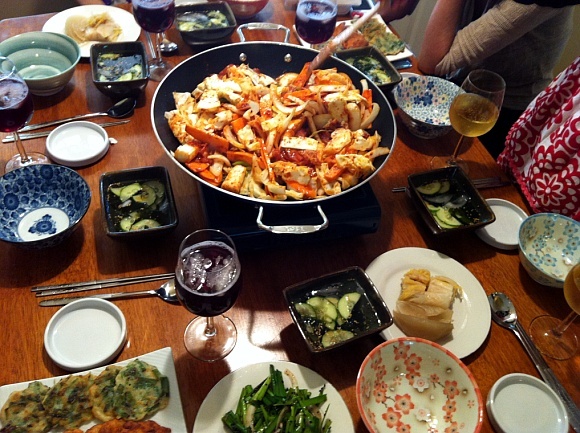 Yukosan and her husband loves my food so I thought invite them to my house and cook a meal for them will be nice. So, I did! I wanted to make a special memory for them. So I made Dak Galbi lunch. 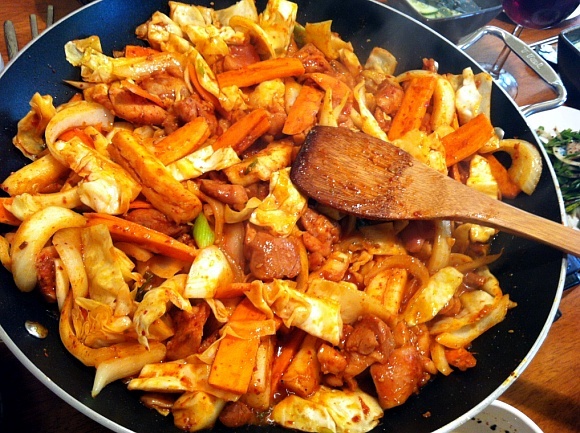 Click to read my first Dak Galbi post!! They loved it too! I was so happy~!!! 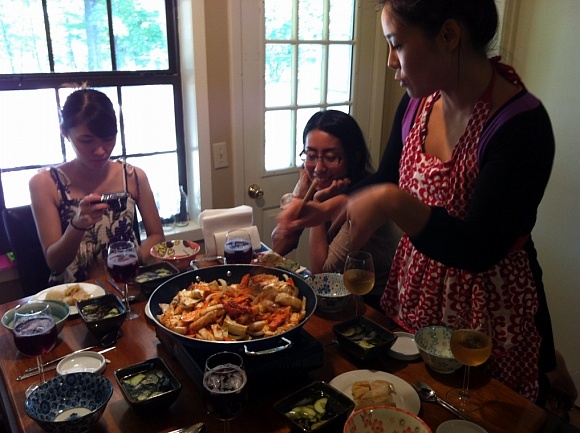 Also my other Japanese friend Mizususan and Yuuki came over. 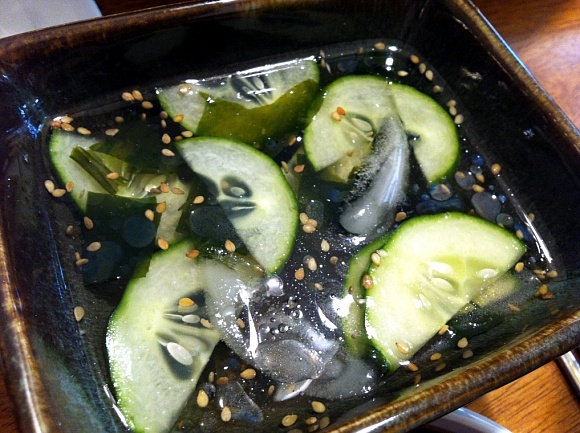 I serve with Korean Cold Cucumber and Seaweed soup. Perfect for eating together with spicy and hot food! I Seasoned with salt, pepper, Korean red flakes, rice vinegar, sesame oil and seeds. Toss all the ingredients right before you serve. 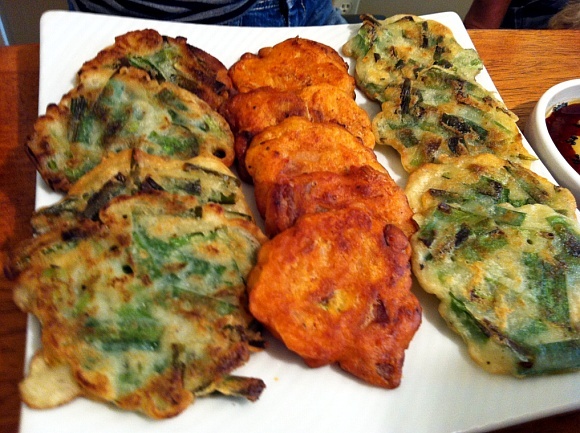 I made 2 different kinds of one bite size little Jeons (Korean savory pancakes). You can also see written recipe by click the link below! They really loved the food I served and I was so happy to see them enjoying! She was a very nice and kind lady, and same time very happy person. I’m so happy and grateful that I met her here, and became her friend. Thank you for everything you did for me Yukosan, we will miss you a lot!!!!!!!! Oh please do share your Korean pancake recipe. 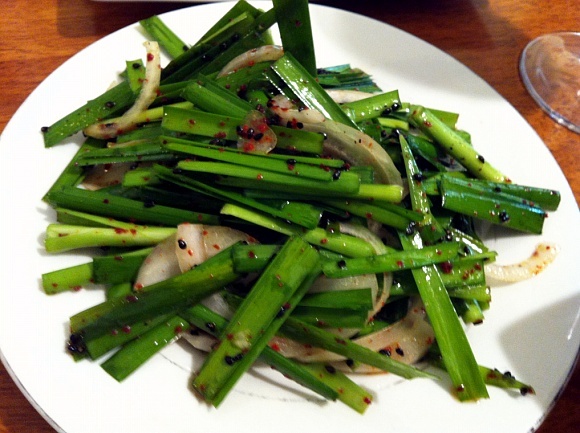 I just got long green onions in my organic grocery bag and I want to try it out. Oh no, the link is not working on comment! Please check the pancake picture below of the text above, I added link there too. You can check my Seafood Chive Pancake recipe by click the link below.